The January transfer window is now closed but that won’t stop the newspapers from speculating ahead of the summer so we’ll bring you all the news and gossip. Today, Arsenal eye a double swoop…. Arsenal boss Arsene Wenger is plotting a £30m double swoop for Southampton midfielder Victor Wanyama and Anderlecht striker Aleksandar Mitrovic this summer, according to reports. While Francis Coquelin’s emergence in recent months has been a welcome surprise, Wenger is still believed to be in the market for another holding midfielder as doubts continue over the futures of Mikel Arteta and Mathieu Flamini. Several names have been linked with a move to the Emirates and although many reports have suggested we want Morgan Schneiderlin, the Daily Star are claiming that Wenger actually has his eye on his midfielder partner Wanyama. The Kenyan international has been outstanding for Southampton since making the move from Celtic in 2013 and the newspaper suggests that we’re ready to table a formal £20m bid for his services at the end of the season. 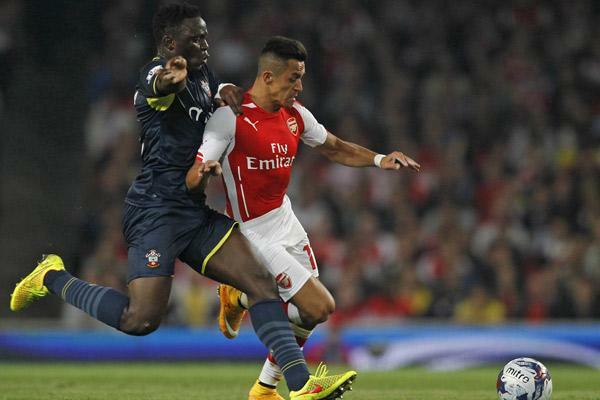 Wanyama is a powerful defensive midfielder who now has plenty of experience in the Premier League and at just 23 years of age he has his best years ahead of him, so he could be a shrewd signing if Arsene can pull it off. The boss is also understood to be keen to strengthen his options up front as the Daily Star claim that he’s ready to make a £10m bid for Anderlecht’s Aleksandar Mitrovic after having him extensively scouted in recent months. Mitrovic is just 20-years-old but has already established himself as one of the best strikers in Belgian football and he’s scored an impressive 20 goals in just 38 appearances so far this season. The Serbian international stands at 6ft 2ins so is more of a target man, which means he’d provide valuable depth behind Olivier Giroud up front. However, he’s been attracting interest from several clubs throughout Europe, so we may face stiff competition for his services. We’ll have to wait and see if this report is accurate but both Wanyama and Mitrovic would be useful additions to the squad if Wenger is able to bring them to the club this summer.